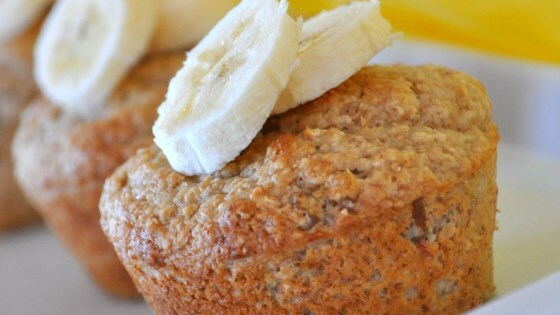 "Fantastic tasting oat bran and whole wheat banana muffin." Preheat oven to 400 degrees F (200 degrees C). Grease a 12 cup muffin tin. In a large bowl, whisk together whole wheat flours, oat bran, sugar, baking powder, and salt. Stir in raisins. In another bowl, mix together yogurt, sour cream, applesauce, maple syrup, egg whites, vanilla, and bananas. Pour yogurt mixture into flour mixture, and mix just enough to combine. Spoon batter into muffin cups. Sprinkle one teaspoon pecans over batter in each cup. Bake muffins in preheated oven for 15 to 20 minutes. Remove from oven, and transfer muffins to a wire rack to cool. This was really really good. I omitted the added sugar, and halved the maple syrup, and used wheat germ instead of oat bran, and it was still excellent. How a muffin should taste.